Motivated Substitute Custodian with solid experience managing all levels of large scale projects. Highly ambitious custodian with background in maintaining a well work environment and a safe and clean facility for myself and others around me. 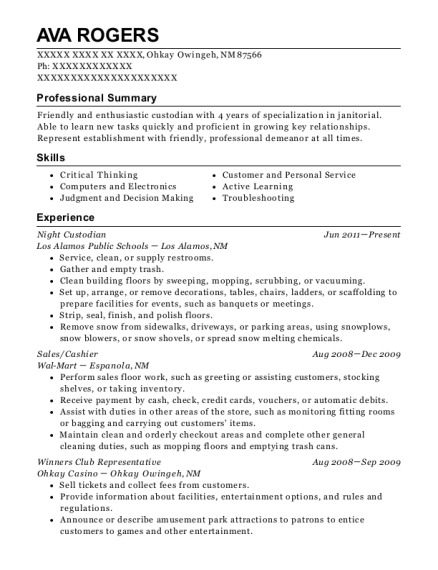 Custodian with 8 years of experience. Areas of expertise include keeping a safe and clean environment, fast paced, organized, and responsible. coordinate, monitor and participate in the major cleaning of the school plant. Sweep, mop, strip, wax, and seal floors; vacuum rugs and carpets, dust, wash, and polish furniture and woodwork. Empty and clean waste receptacles, including barrels. Pick up paper and other debris from school grounds, walk areas, and the areas adjacent to the school facilities; sweep concrete surfaces adjacent to the school buildings. Lock and unlock gates and doors, and set security systems; raise and lower flags Clean restrooms; fill towel dispenser, sanitize toilets urinals, and sinks, clean mirrors, sweep and mop. wipe down the restroom stalls. Cleaning lunchroom by sweeping , moping, wiping tables and windows, dusting vints, clearing water drains empting out trash bins replacing liners cleaning restroom; changing towel dispensers and bathroom tissue, disinfecting toilet bowels and urinals, empting trash, wiping mirrors. Maintained auto body and upholstery and mechanic area clean and ready for students to work. Wash vehicles, organized vehicles in order as advised. Drive vehicles and place them in proper parking spaces. wash and deep clean concrete grounds deep clean office organize welding area by vacuuming, sweeping, dusting, high dusting, and sanitizing tools. 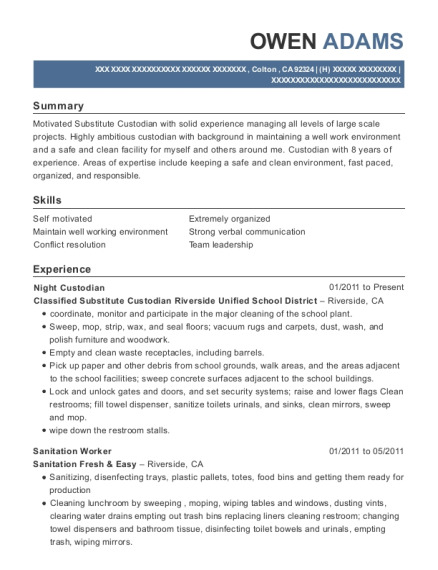 This is a resume for a Night Custodian in Colton, California with experience working for such companies as Classified Substitute Custodian Riverside Unified School District and Sanitation Fresh & Easy. 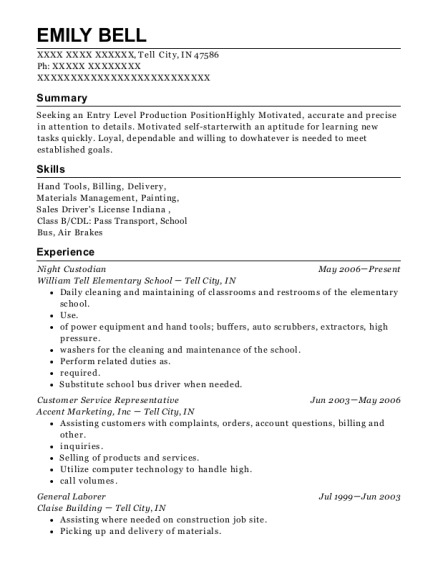 The grade for this resume is 0 and is one of hundreds of Night Custodian resumes available on our site for free. 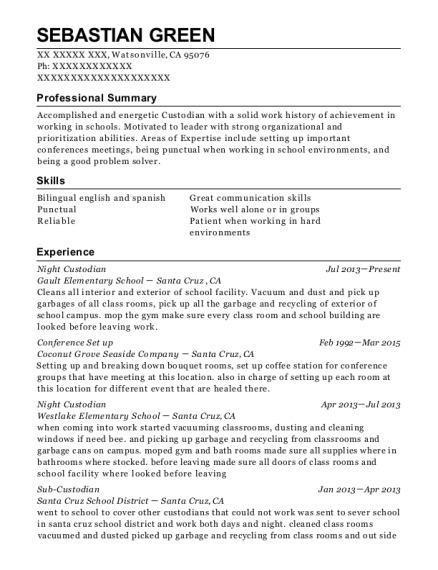 Use these resumes as templates to get help creating the best Night Custodian resume.